Ms Nipe likes to snipe. 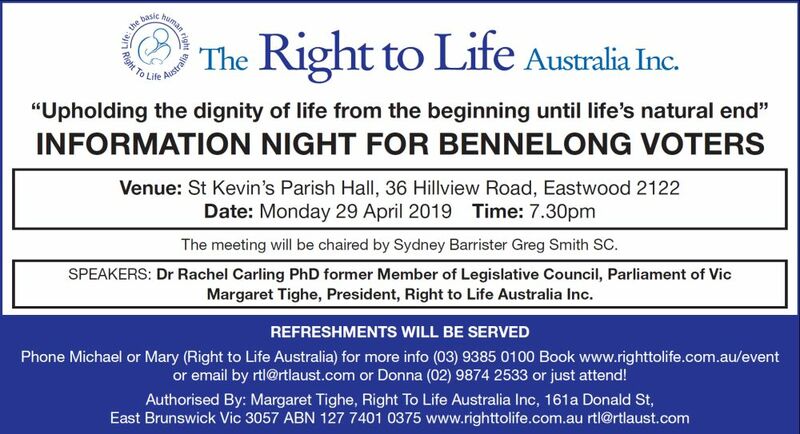 She blogged during the election on a pamphlet authorised by Margaret Tighe for Right to Life Australia entitled “Euthanasia is Toxic”. Read the blog here. Although the blog is entitled “Lies, misrepresentation and distortion” Ms Nipe fails to identify any specific lies in the blog. She does imply that it is not true – as the pamphlet states - that the Andrews Labor Government is seeking to import Nembutal but only succeeds in stating the well-known fact that this is a federal matter. All this means is that the Andrews Government in seeking to import Nembutal for use in Victoria for assisted suicide and euthanasia would need federal co-operation, which it may or may not get. The rest of the blog really consists of two main arguments – whether “assisted dying” under Victoria’s law can be truthfully described as suicide and whether there is any risk to vulnerable people from the law. Ms Nipe concedes that “it is certainly true that VAD is the deliberate ending of a person’s life at their behest and (almost always) by their own hand”. This concession is decisive because “the deliberate ending of a person’s life by their own hand” is the very definition of suicide. Interestingly the list of factors contributing to suicide which Ms Nipe cites from the Black Dog Institute in a vain attempt to distinguish it from “voluntary assisted dying” include “physical illness” and “poor living circumstances” as well as listing “supportive social relationships”, “family harmony” and “positive connections to good health services” as “protective factors” that reduce suicidal behaviour. Data from Oregon shows that feeling a burden on family on friends is a key contributor to requests for assisted suicide under its law. A recent report from a population wide 20 year study in England shows that suicide following a cancer diagnosis is linked to undiagnosed and untreated depression. This is one of the fundamental problem that the Victorian law fails to address - leaving it entirely in the hands of the assessing doctors whether they bother to refer a person for a mental health assessment or not. Ms Nipe oddly take issue with the pamphlet citing only 2 British MPs as somehow unrepresentative but she fails to mention that the latest euthanasia bill was defeated in the House of Commons by 330 votes to 118. Ms Nipe snipes at the pamphlet quoting the opposition of the World Medical Association, the Australian Medical Association and leading Australian doctors to the Victorian law as irrelevant because an unsigned article from Gizmodo Australia reports that a Sydney doctor called “John” – no more details – believes that the earth is flat. A doctor called John believes the earth is flat. Therefore some doctors hold false beliefs. The World Medical Association is made up of doctors. It believes assisted suicide and euthanasia cannot be safely legalised. This belief may be false. Compare this syllogism to see how useful it is. Some bloggers say stupid things. Ms Nipe is a blogger. Ms Nipe may say stupid things. And of course while Ms Snipe is running logically flawed arguments she naturally has recourse to an ad hominem attack dismissing former Prime Minister Paul Keating’s astute warning that legalising euthanasia or assisted suicide “constitutes an unacceptable departure in our approach to human existence” because … you guessed it … he is a Catholic.